When does it need resurfacing? No matter whether you have a hard court, artificial clay or artificial grass, every tennis court has a lifespan before it will begin to deteriorate. On a hard court this will typically start with the paint fading and chipping, before the surface itself begins to wear down and cracks start to appear. Slight issues such as a minor wear and tiny cracks can be fixed with standard maintenance, but eventually the court will need full resurfacing. This typically occurs when the surface has gone beyond the point where maintenance solves the problem. Once you begin to notice cracks and dents in the court it is a good idea to think about resurfacing. 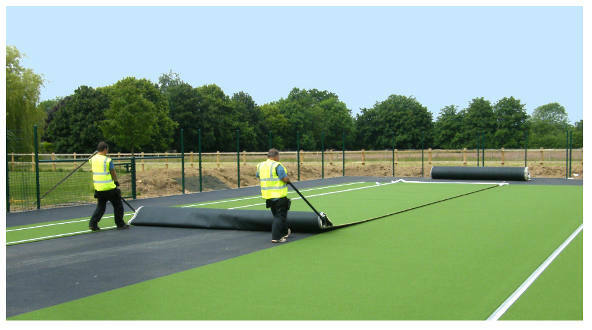 However, it is important to note that you should not attempt to have tennis court resurfacing work carried out over the winter or autumn as the wet weather and difficult conditions can cause havoc with the surface. Wait for the spring or summer when you can have the court laid properly. Why should I have my court resurfaced? When you start to notice serious problems with your court surface then you should look to get the court resurfaced as soon as possible. If you fail to do so the problems will only get worse with time and it can get to the point where the court becomes so problematic that it will require a complete reconstruction rather than simply resurfacing. Additionally, when a tennis court surface falls into a poor state of repair it can actually become dangerous to play on. Kinks and dents in the surface can make you trip and fall whilst running. The poor state of the surface also means it isn’t enjoyable to play on, so it really is worth getting this done as soon as possible.